Discussion in 'Edged Tools' started by moses the armenian, Jan 26, 2016. Was wondering if any one here has a helko ax and if yes what model and what's your opinion of the line ?? I have two, the camp hatchet and the classic journeyman axe. 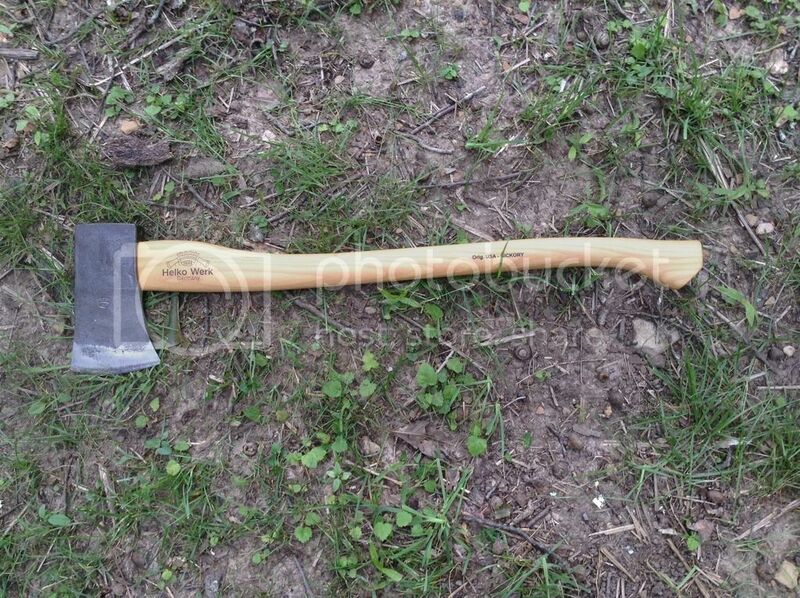 Hatchet head is out of alignment and handle grain is full 90 deg perpendicular to the proper alignment. Last Dec I got the journeyman axe and its grain is not perfect but acceptable however the handle was not driven fully into the head. I complained and Helko sent me a new handle and I installed it properly myself. The heads "ring" nicely yet the poll is soft so I'm assuming they are differentially heat treated. But they aren't cheap axes and both had issues so I doubt I'll buy another one. In hind sight I feel I should have just spent the extra and got a gransfors bruks small forest axe. I used to have one and it came 100% perfect from the factory. Mind you, they were produced long before the Artsy-Fartsy Manly Man axe fad of recent times. None the less, I would trust Helko to deliver a perfectly good axe today. I hate that fad. I had to quit wearing most of my flannels, and trim back my beard to avoid being associated with that stuff. Most of these sissies have nice beards, but can't even change a flat tire. They're ruining manliness in yet another fashion! Ha ha ha.. The above post.. So true.. I have the Traditional Pioneer & it is very nice. Thanks to Amazon the mask came damaged, but my brother made a new one for me, pictured below. The head had a very slight bit of play so I put another metal wedge in & all good. Thank you for the input guys !!! Right now I'm looking at the traditional line either the hatchet or perhaps even the black forest woodworker any of you guys have either of these? I have the Classic Pioneer & it is very nice. Thanks to Amazon the mask came damaged, but my brother made a new one for me, pictured below. That looks really nice how does the classic line differ from the traditional line ??? I've got a Helko German Standard Axe that I really like. I haven't used it a great deal (not near as much as some of my other axes), but what use it has seen its done well. I think they are very much a good deal. I said classic but I have the traditional. Traditional has the rough forged appearance & the classic has the polished head. Both lines have boiled linseed oil on the handles instead of clear paint too. When you place your order be specific to request a hand picked axe and list/describe what you expect. In my note to Helko I failed to request that they check that the handle is driven fully into the head. Mine had a gap between the handle and head. I did not think that this is something I need to request but apparently you cannot expect a properly built axe today and ordering off the internet means you cannot handpick/inspect it yourself before buying! This seems to be a disturbing trend with these boutique axes. Your Helko, Tobiism's Bushman, my Council. For a hundred plus dollars. I don't think it is unreasonable to expect the axe to show up in working condition. Or for the head to remain connected to the handle for a reasonable amout of time. I realize location and humidity are factors. But I have been swinging axes for fifty years. This is a new phenomenon, and not a good one. When you pay stupid amounts of money for an axe. You should expect more, and it should live up to those expectations. Not that the axe will chop trees by itself. But that the level of fit and finish is, at the very least, above average. Another worring bit of news is the total lack of response to Tobiism. With regard to his requests for help. Lamnia is bad enough. But for Wetterlings to act in this way is cause for concern. Especially since I believe they are now owned by Granfors Bruks. If we have to go through this level of work to get a functioning axe. Might just a well scoop up an old Collins from the big water and do it ourselves. I guess one could reasonably think these are one offs. That slipped through the Quality Control process. But there seems to be quite a few. Also it appears to be more than just one brand. One could also assume, folks complaining are just whiners. You know the type. Folks that cry because the head was supposed to weigh 1.6 pounds. But it actually weighs 1.625, and the handle is an eigth on an inch shorter than quoted in the specs. I don't think this is what we are looking at. I believe the issues are real. On the good side. There is a Vendor on here for Helko USA or at least there was in December. At least he is on this side of the big pond. Perhaps he will chime in. And offer some worthy advice. And even some reassurances. I myself was ready to dump some cash on that new Helko Journeyman Axe. But it was reviews just like these on Amazon, and even within their own forum that have delayed that purchase. I may give Snow & Nealy another chance now that they are back in the United States. At least I can drive to Maine and chat with them. Just some thoughts from a long time axe guy. To be fair. I own several Wetterlings and GB axes. I have had zero issues with any of them. But other than my Bushman, which I find to be a surperb tool. They have all been older and purchased off sites like this one. I own six, from basic to classic lines, hatchet to full size. One of the attractions of the brand is the value and edge retention. Almost all the line is easily under the century mark for price. The US rep can be contacted through the Helko sub-forum and is based, or was, out of Los Angeles. If anyone ever gets an axe from us they're unhappy with, just reach out and let us know. We're always happy to work with you and make it right. Our axes come with a price tag, so if you feel there's an issue, just get in touch with us. Do keep in mind, we sell a lot of axes. All are inspected, I assure you, but of course, occasionally a few get out that aren't perfect. In truth, this happens across the industry. While many of you may disagree, and that's okay, most of the top axe manufacturers.....we all make good quality products. I respect our competitors and often commend them. Unfortunately, across the web, some are quick to decry a single axe and refuse to go with that company forever. To each his own. I don't need to push Helko or claim we are better than the rest; we do just fine without that sort of preaching. Helko is one of Europe's oldest axe makers, and has been around since 1844. If anyone ever has any questions about our axes, please feel welcome to reach out to us and we're more than happy to chat with you about them. To CaliforniaCanuk, for your specific situation, you brought an issue to our attention and we offered multiple solutions or suggestions. I believe we went with your own suggestion. If you were not happy with the outcome, I'm sorry to hear it. As a person who made a living out of selling earthmoving equipment. I understand that issues occur. I feel I had great success not because I was a slick salesman, I wasn't. I succeeded because I answered my phone. Even when I knew the person on the other end was going to yell at me. Whether it was my fault or not. I took responsibility for the issue. Customers never want to hear, "It's not my fault" They just want their problems to go away. When someone steps up and takes responsibility. It tends to defuse the situation. From there both sides can move forward and deal with the problems. I think stepping in here and offering a personal touch speaks volumes. And goes a long way toward my comfort level with Helko USA in general and you specifically. No manufacturer sends 100% perfect products off their assembly lines. I learned that the hard way. Where the rubber meets the road is the customer support to step up and deal with the issues that arise. It builds a loyal following. You have just earned my next axe purchase. When I am ready, I will be in touch! I'll also agree with that sentiment. Having worked quality control in manufacturing and construction for about 10 years, I've seen this surface time and again. While it's typically not an overall problem with the product, mistakes do happen, some workers get sloppy, and some things get past QC, particularly when the typical QC inspection frequency is only 10% in many areas. Going over absolutely every product with a fine toothed comb would push prices so high that we'd never buy them. I also try to always remember that my first Gransfors Bruks came with a curved head with a huge patch of cold shut on one of the cheeks. I managed to trade it out, and I'm happy with the replacement I got. I've also talked to people that refuse to buy Ruger firearms due to supposed bad experiences, but I rarely buy anything besides Ruger because I think they're built so well, and are so reliable. I'm not in the market right now, but given Helko's response a few posts up, I'll probably give them a run soon. If their customers matter to them, it makes a huge, huge difference. I have a BFW and I love it. Its a heavy axe for the compact package, and I am thinking of going with somethine a little smaller for backpacking. That being said its a great piece of kit, chops as well as it splits. Have a small classic series. I forget the name, but it's the one with a 20 inch handle. It is very nice. 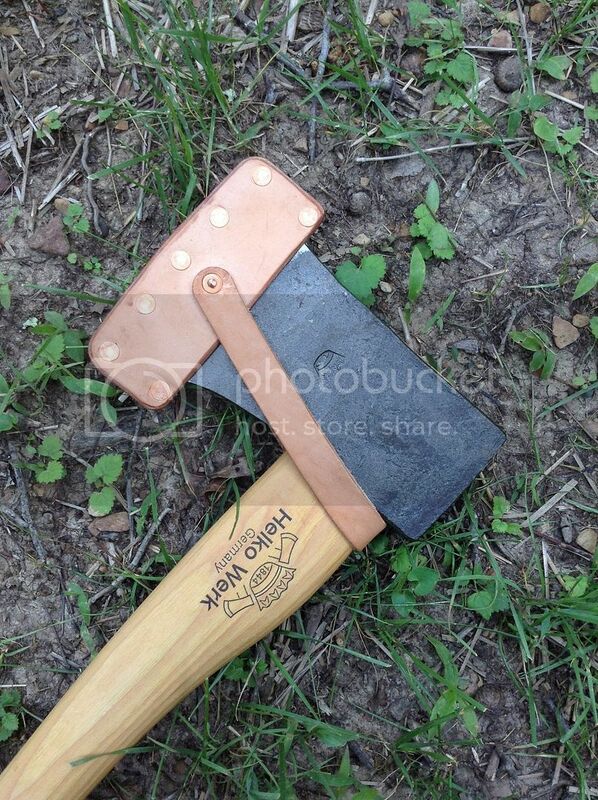 It is the best small axe/hatchet I have ever used. I could not be more pleased. I dont think the Swedish elves with all thier special magic could make any better tool. I accepted your offer of a partial resolve but enough of that! I do like the Journeyman axe size and the head seems well tempered. I think a lot of BCUSA members would like it for that. Since you have a sub-forum here, is there a way for your company to know that one of us "axe geeks" is placing the order? Maybe a code that lets you know a "BCUSA member is ordering" which would trigger a quick 5 point inspection of the item before shipping"? 1. head alignment - check! 2. head symmetry - check! 3. handle wood grain in line with edge and runs straight for the full length of the handle - check! 4. tight wedge - check! 5. no gap between handle and eye top or bottom - check! Hi all! I'm new here so please bear with me. I have been hunting for a new axe and chose to get the Helko Mini Spalter. I would be glad to hear some opinions on this axe and how it preforms and holds up. My problem is, I have read so many low reviews around the web of people receiving a poor quality axe in important areas, and bad customer service. I was going to order the axe from the Helko North America web site over the phone, but in the process, came across a Google review that you can go see from Daryl Warner talking of his extremely poor experience in dealing with Helko explaining it in good detail, which supports the many poor reviews I've read. I'm afraid that I'll receive an axe with poorly fitting head, bad wood grain in handle, axe head not symmetrical and crooked making off balance, blade not properly sharpened, metal around the eye not symmetrical all the way around - thicker on one side, much thinner on the other and gaps or looseness ... all these things I've read about in their reviews. A hand forged axe is going to have some imperfections, but I’m talking about the quality deal busters that should never pass in a quality made axe. The guy that left the Google review stated that he called Helko the day he received his axe and explained what all was wrong with it and was told he should have expected those imperfections, and the problem was his lack of knowledge, and he should have expected to have to regrind it (despite product description saying ready to use) and he was refused a return. Wow. I mean WOW! He said that after he posted his Google review, that the owner then reached out to him and offered to replace his axe free of charge. I really want to order this axe from them but based on the many poor reviews, I'm taking a chance of receiving a poor quality axe and poor customer service as well (which I would be from any manufacturer, but I'm wanting Helko's). I don't think if I call to order my axe from Helko and ask the customer service rep to make sure the one that they pick is thoroughly checked out and passes the quality test that would actually happen. And if there was a problem and I reached out for refund I see how they treated other customers and I don't want that. I understand that every maker has some poor reviews and things happen sometimes, but also red flags are there for a reason and shouldn’t always be blown off. I really had a hard time finding the right style of axe for me and almost gave up but then came across the Mini Spalter and said that's it! So it's not as easy as just buying some other axe. Shopping for the right axe is like shopping for the right lure in the Bass Pro isles (which I'm addicted to). Lots of different things to take into consideration especially when you’re talking about a lot of money, and for me, spending over $100 on a designer name axe is a lot of money so I expect a quality axe and great customer service. Am I incorrect for that or have too high hopes, perhaps being unreasonable? So any feedback would be appreciated! svh and Barry J like this. I have two Helkos and have no complaints with either. I have a Helko Vario axe. The jury is still out on this one. Perhaps it’s just the non traditional look that keeps me from really loving it. I guess I just need to get out and give it another shot.